My Arbutus wooden cooking utensils come in a wide range of sizes and shapes to delight all of your culinary crafts. Designed for all kinds of cooking styles and different size pots, pans and woks, you will find something perfect for your hand and cooking style, including left handed cooking utensils. Wooden cooking utensils are perfect to use for your non stick utensils. They won't scratch or mar the special coatings. 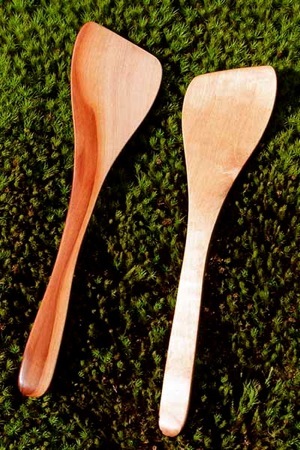 And because the Arbutus/Madrone wood is so strong, your wood kitchen utensils will last and last! Each of these wood cooking utensils, servers or spatulas can be used both for cooking and for serving at the dinner table. 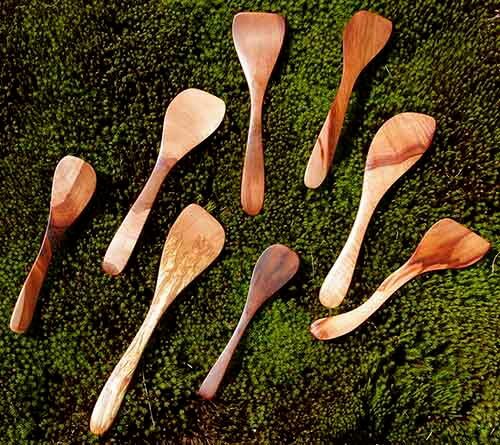 Chefs will delight in the unique shapes and admire the lasting quality of the wood cooking spoons. Hostesses will augment their serveware and fine dishes with them as well. The different grades provide for both heavy kitchen use or for serving at dinner parties. 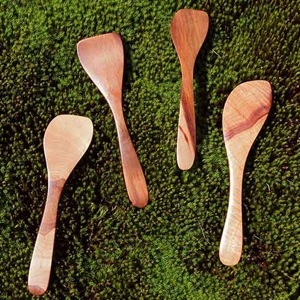 Arbutus Arts wooden cooking utensils come in 4 sizes: small, medium, large, and extra large. You can see in the picture the relative sizes. 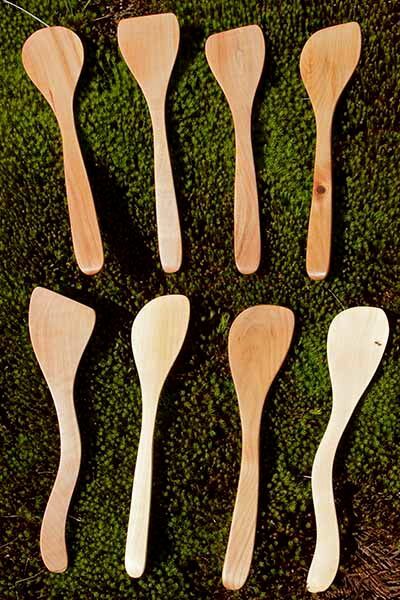 Small wooden servers or spatulas are perfect for cooking for small pots and pans and excellent for serving for small dishes. Medium wood kitchen utensils are larger and perfect for a small to medium pot. Small and medium sizes are my favorites because I like cooking close in and most of my pots and pans are medium size. Large servers are my biggest seller and good for an average family size and day to day cooking and serving for several people. And extra large is for those big bowls, pots, woks and pans, and for those used to having more distance from the flame. I guarantee your hand will reach for your wooden cooking utensils before any plastic or metal ones! It's the warm feel of the Arbutus wood in your hand that is just so appealing. In case your first choice is not in stock can we send you your second choice? 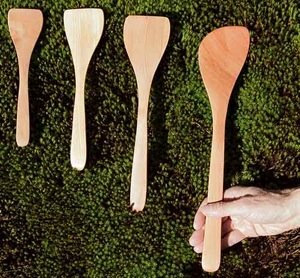 My wooden cooking utensils are handmade which means each piece is unique as is the wood grain and its colour and texture. They will not exactly match what you see in the photos. It will match the quality and styles you see in the pictures. Above is a typical Deluxe selection, Large size, Rounded Server with a curved handle: a lefty and a righty. Above is a typical Ultra selection, Large size, Angled Spatula: a lefty and a righty. Wooden cooking utensils with a richer grain and a finer, smoother finish. The pieces in the bottom image are from a giant burl at the base of an Arbutus tree. 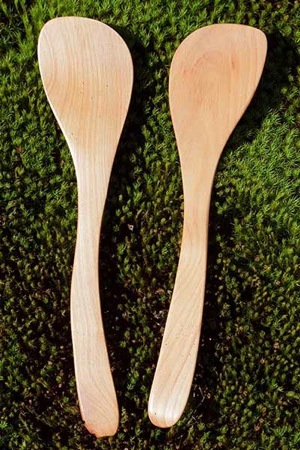 It is hard to do justice with the pictures for these fine wooden serving spoons. They are smooth as silk, sanded to 3000 grit. They are a delight to use and touch, a unique utensil with a real personality! They will make a superb women's Christmas gift or imagine adding them to Christmas food gift baskets!